Sam and I(Linda) specialize in working alongside the parents of Junior golfers as parent coaches. For those seeking basic golf-parent knowledge and looking ahead to college opportunities for their Junior golfer, we’ve got your back. Utilizing personality-based learning, we help parents achieve healthier levels of communication within the home and a deeper understanding of family dynamics altogether. To offer you, the parent, an all-around healthy golf-family experience we are proud to have additional experts on our team to answer questions we can’t. Nick Askey, DC, ACP grew up in South Central Wisconsin playing high school golf for the Baraboo High School Thunderbird’s golf team. He graduated with a microbiology degree from the University of Wisconsin-Madison. Nick graduated as Valedictorian from Palmer College of Chiropractic in Davenport, Iowa in 2010 and moved to Texas to work for Airrosti Rehab Centers. Treating muscle and joint injuries with Airrosti Rehab Centers, Nick has worked with some of South Texas’ most competitive golfers as well as being a team doctor for the San Antonio Scorpions soccer team. He is certified Medical Level One with the Titleist Performance Institute. Nick stays busy traveling 6-8 weekends a year throughout the country lecturing to other chiropractors, physical therapists, athletic trainers on functional movement assessment and rehabilitation of sports injuries. In his free time, he enjoys ultra-running, watching his favorite sports teams, trying new restaurants with his wife, Marisol, and playing with his enormous Great Dane, Nissan. 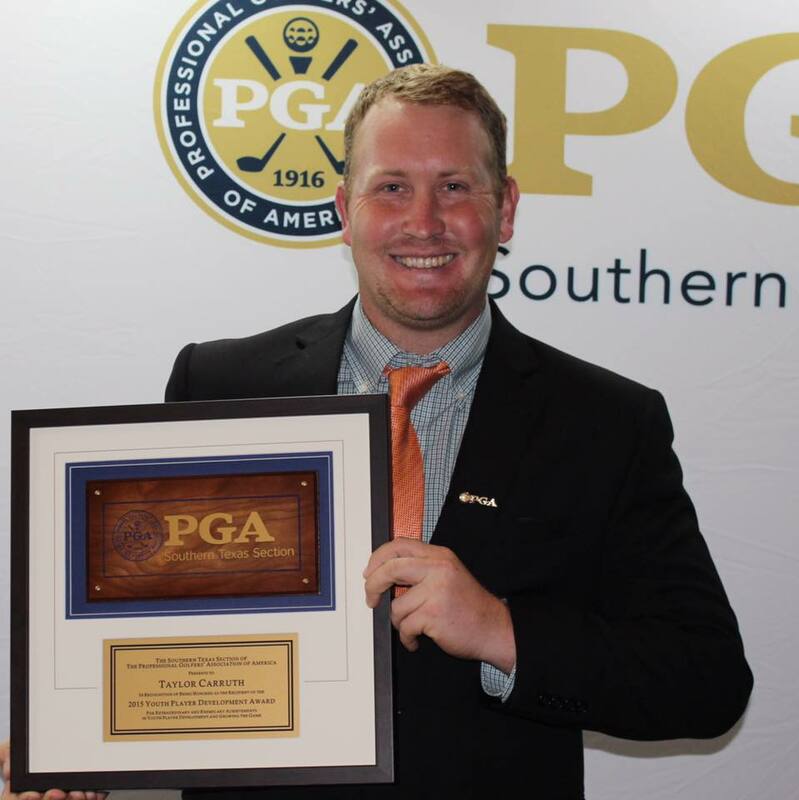 Taylor Carruth, PGA grew up in Fredericksburg, TX playing high school golf for the Fredericksburg Billies’ golf team. He graduated from Sam Houston State University with a Bachelor’s of Business Administration (B.B.A.) degree with a specialization in PGA Golf Management in Huntsville, TX in 2013 and moved to San Antonio, TX in the summer of 2013. Monitoring and supervising junior golfers, Taylor has worked with talented juniors by stressing the importance of playing and discovering the game of golf through unique golf environments. He is a Class A Teaching Professional with PGA of America and The First Tee Golf and Life Skills coach with The First Tee Network. In addition, he serves and provides his talents for the Southern Texas PGA section. In his free time, he enjoys stay active outside, discovers new places and family time. Email Taylor Carruth at taylor@golfsanantonio.org to schedule your young person for any of the following programs. The First Tee of Greater San Antonio is the local Chapter of an international youth development organization whose mission is to impact the lives of young people by providing educational programs that build character, instill life-enhancing values and promote healthy choices through the game of golf. Since 2001, The First Tee of Greater San Antonio has introduced the game of golf and its inherent values to more than 37,000 young people. On golf courses, in elementary schools and on military installations, we’ve helped shape the lives of young people from all walks of life by teaching them values like respect, courtesy, and sportsmanship through the game of golf. In addition to learning fundamentals of the golf swing and the game, our character education and life skills program helps young people prepare for success in high school, college, and life. To learn more about The First Tee of Greater San Antonio, visit www.thefirstteesanantonio.org today.